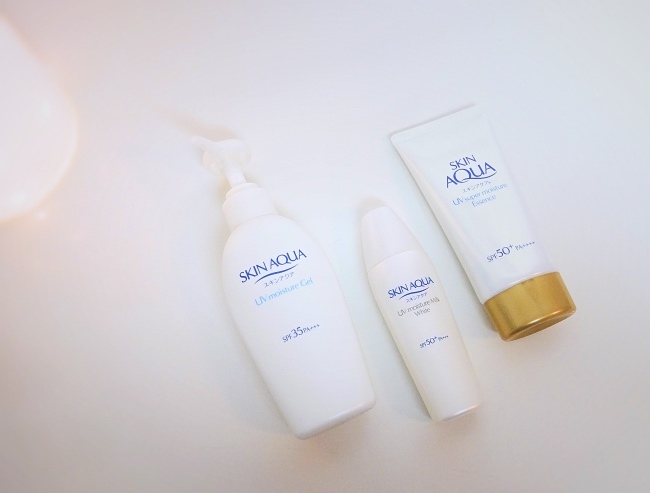 Sunscreen reviews are not very exciting, but I wanted to share my ongoing love for the Skin Aqua sunscreen range. I have been using them since last spring and even repurchased them more than a couple times now. They are perfect for my current skin conditions that I haven't looked at other sunscreen options in a while. I usually get them on Amazon or eBay. They are relatively easy to acquire (some ship from overseas but there are U.S. sellers available as well) and priced reasonably (under $15 USD). I stumbled upon the brand while I was looking for a sunscreen for my neck area. I wanted something that was non-waterproof yet could provide higher UVA protection. Skin Aqua UV super moisture essence (available on eBay) seemed to fit the bill. This has a gel cream consistency and is very hydrating without being greasy. It is also gentle on my neck where I sometimes find more sensitive than my face. I have noticed that the skin tone in my neck area is much brighter than before (now it matches my complexion) probably thanks to the higher UVA protection (notice PA++++). 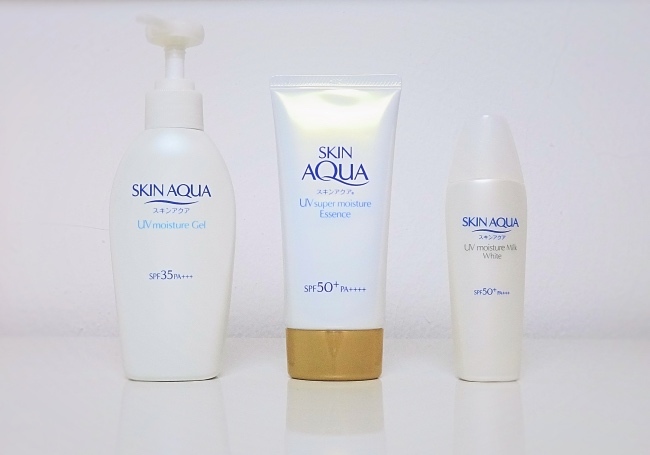 Impressed by the initial purchase, I looked for other varieties offered by Skin Aqua. The UV moisture milk was purchased next. It is a typical water resistant Japanese sunscreen with both chemical and physical blockers. However, unlike the most I've tried, Skin Aqua UV moisture milk (available on eBay) isn't drying a bit. Yes, it is water resistant and makes a great makeup base controlling oil in the T-zone, yet it does not strip moisture. I think it is perfect for aging combination skin like mine. I bought Skin Aqua UV moisture Gel (available on eBay) last summer to use it on my arms and legs. It is a cooling yet hydrating gel that feels amazing on contact. This does not feel greasy nor tacky and leaves skin hydrated. I still have a little left and continue to use it on my hands everyday before I go out. This one does not come with a higher SPF number but the PA+++ indicates that it is sufficient with UVA blocking agents. I am more concerned about tanning than burning, so this is enough for what I need. I will repurchase this next summer. You can find the ingredient lists here. They all contain some alcohol to help better application. I personally don't mind a bit of alcohol especially when I don't find these sunscreens drying on my skin. I actually think that they are rather hydrating and much gentler than others. I believe I can use Skin Aqua UV moisture milk all year round, but have decided to use the essence type on my face and neck for a while since now New York winter is at its full force. If you are like me and find Asian sunscreens are more reliable (plus don't mind ordering on line as well as waiting a bit), do take a look at this range. The brand also offers options that are suitable for oilier skin types (look for something that has "Sara Sara" in the descriptions (on eBay)). Oh I like the sounds of the essence one a lot! I'm going to look and see if I can get the brand here. I think you'd love it. It is cosmetically elegant, which I think is as important as the protection. You have better sunscreen options in Canada than in the U.S. It is ridiculous that most U.S. ones still depend on Avobenzone. I've tried the moisture gel and milk, so far my fav is moisture milk. Curious to try moisture essence! I think the essence type (more of a gel cream from where I see) is the most hydrating one although the whole range seems to target the dehydrated skin types. Let me know how you like it if you end up trying it. I'm just diving more into the world of Asian sunscreens now so it's good to learn about this brand which is new to me. The moisture essence and moisture milk both sound really nice. What I like about Asian sunscreens is that they're more moisturizing and less likely to have a white cast. The milk type contains some physical blockers so it "brightens" up the complexion but does not leave any white cast. In face, you can get away with just adding some powder over on a low key day. All three mentioned here are cosmetically elegant and work well with base makeup. Unlike my sunscreen choices, I haven't used many Asian skincare. I am always amazed to read about your experience with them on your blog!